After Round 7, the only player with a perfect score is Wang from China in Under 10. 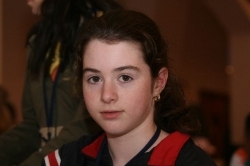 In under 18 Girls, Gomes lost against Nemcova and Betül Cemre Y?ld?z who won an exchange down but had a good play against the opponent king with the help of the advanced b pawn is going to play the Indian hopeful in round 8. In Boys U12 Bajarani won against Nyzhnik after the latter's somewhat premature piece sacrifice. You can find out more about the results at the link below. 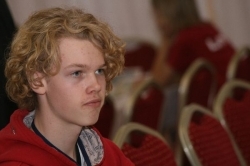 GM Popov won againt Prujissers as did FM Nakhapetiane against IM Warakowski to reach 6 points. IM Grigoryan also joined the leaders by winning against IM Vocaturo. 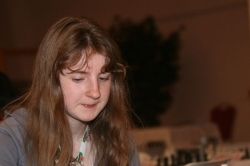 In Under 18 Girls Group, Mary Ann Gomes lost against WIM Katerina Nemcova to lose her sole leading position. WFM Steil-Antoni and WFM Hamrakulova drew to reach 5 points while they were joined by WIM Mikadze and WIM Betül Cemre Y?ld?z both winning against WFM Rysbayeva and WIM Chirivi respectively. On the first board, WIM Y?ld?z is going to play against Gomes with white while WIM Nemcova is going to face WIM Mikadze. Under 16 Group is led by FM Leniart and FM Chirila with 6 points followed by Nabaty, FM Bregadze, FM Piorun FM Recure Guerra and FM Pereira. Tomorrow, FM Leniart and FM Chirila are going to face each other in a crucial game. In Girls section of the same age group, WFM Girya and Beridze drew to reach 6 points joined by Tsatsalashvili winning against WFM Öztürk. Iordanidou and WFM Ton drew to reach 5.5 points. Left: WFM Nazi Paikidze from Gerogia Right: Varun Krishnan from USA but not India as many would suspect including the writer of this report. In the Under 14 Group, IM Sjugirov drew with FM Ter-Sahakyan while Plat, Sethuraman, FM Robson and Belous drew their games to make it to 5.5 while FM Vidit won to catch IM Sjugirov. 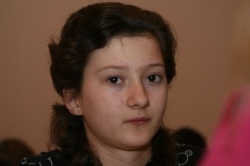 In Under 14 Girls, WGM Paikidze and Adamowicz are leading with 5,5 points. 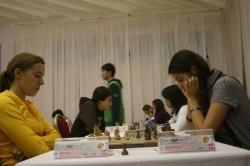 In Under 12, FM Bajaran won against Nyhznyk. FM Bajarani and Naroditsky are leading the big group to play in the group. 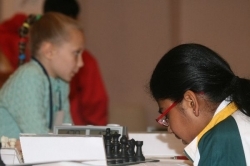 In Under 12 Girls group, Efroimoski won to reach seven points out of seven games. In Under 10 group, Wang won against Prince to secure his leading position with the perfect score. He is followed by Antipov who won against Khomidov. 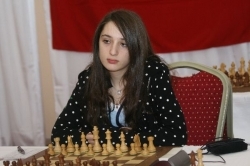 In Under 10 Girls, Styazhkina drew with Khademlsharieh and leads with 6.5 followed by some youngsters with 6. 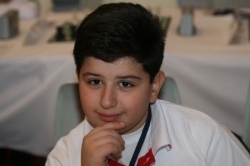 In Under 8 group, Ayvazyan won against Qasimov who was at the prect score while Savenkow won against Shtembuliak. In Under 8 Girls, Gunay Mammadzada, Buse Vatansever, Megna C H, Furtado, Shivacheva and Zhou are sharing the second place after Nguyen who is still leading. 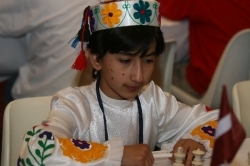 In Under 8 group, Ayvazyan won against Qasimov who was at the prect score while Savenkow won against Shtembuliiak. In Under 8 Girls, Gunay Mammadzada, Buse Vatansever, Megna C H, Furtardo, Shivacheva and Zhou are sharing the second place after Nguyen who is still leading.